Not a lot of words here, but an elegant, succinct map for a pursuit which could occupy the better part of a lifetime to undertake and understand. I adored hearing this metaphor at the SAT Conference, tucked within a flow of words during discussion about the map for Path. Claudio articulated a few typical shapes of spiritual path while wryly acknowledging that, “It is a paradox: training is a map to study something which is not on the map.” The most common map is an upward progression with a pinnacle. But seekers have described other shapes. For some it surges down and down in. For others it follows a wheel shape in which the seeker winds upward, reaching a the pinnacle at the halfway point then wending downward into integration that might feel disappointing after the illumination pinnacle. He then suggested that people draw a map of their own Path experience so far and to split into groups to explore those shapes. 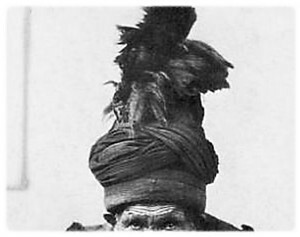 Guideposts, like the dervish turban, are a way to encapsulate challenges for contemplation, to measure one’s experience, and to form intention. What is it that we want to accomplish? For Sufis, renunciation is a stage. (The word ‘dervish’ means a renunciate, materially poor and rich in spirit.) Renunciation connotes the alchemy involved in releasing attachments only to discover subtler ones. Does renunciation lead to seeing to the ‘ridiculousness’ of ego? Yes, we hope, but such a seeing is blindness if it happens inside the ego, inside the delusional mind. Sufi path requires seeing with the heart. It is all very well to say ‘oh yeah, I get this’, but very hard to actually experience it. ‘Get’ is not experience. ‘Get’ is a hit and run. ‘Experience’ is a body smeared beneath a steamroller, every bone broken, the brains mauled, the flesh pancaked. Do we survive? Do we give up? Do we liquify and transform like a butterfly? Seek sincerely, intentionally, feeling it all, finding the next knowing. We have to stay wary of our certainty about anything while not giving up on seeking.